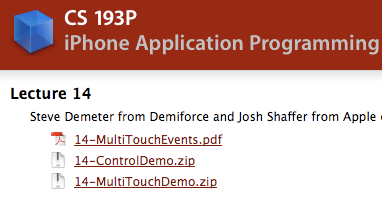 If you haven’t heard about Stanford’s iPhone development course (coral), then I’m not sure where you’ve been. It’s certainly had enough publicity that it needs no more introduction from me, but I figure that I might as well lavish it with my praises too. Therefore, let me start by saying that it’s AWESOME. All of the materials are posted realtime with the classes, including videos of the lectures posted to iTunes U. Basically, follow along with the lectures and do all of the assignments and you’ll pick up the coding just as fast as you’d expect taking a class. The layout is phenominal, that’s all there really is to say. The only other note is that I’m pretty sure they clear out the website every time the class restarts, so I suggest downloading all of the released documents and lectures for later use. I won’t be posting them here, since I’m sure that would violate numerous copyright laws, but I will definitely have them all stored for later use. So if you try it, report back with how you like it! I want to hear your opinions. Also, if you have good code samples, post those too, you can never have enough example code. The only thing to remember is that they reuse assignments, so try not to give away complete assignments. Awesome! Nice to see Stanford acting as a billboard, and kudos to them for offering classes that typically exist at the community college level. Maybe their History department could start offering classes in Windows XP as well.